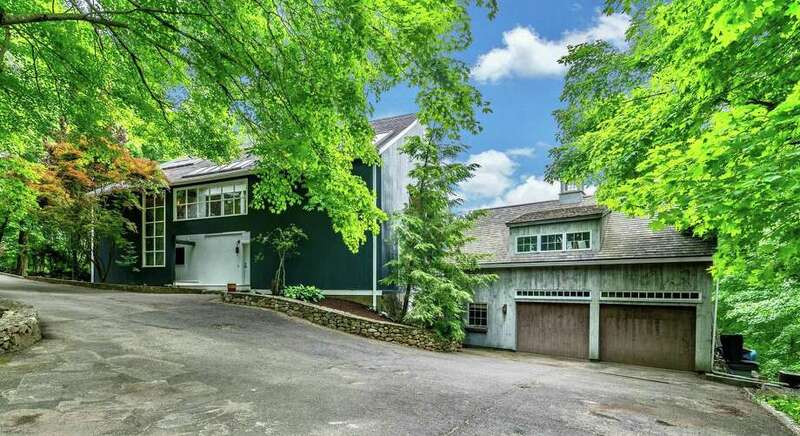 The architecturally significant house at 58 Wells Hill Road can best be described as a contemporary house wrapped in a restored vintage barn with a barn-like detached garage. WESTON — Through the ages architects have created more than two dozen styles of houses from the ubiquitous traditional colonial to the mid-century modern, from the Cape Cod and ranch to the Mediterranean and Tudor. House styles nearly run the whole alphabet from Arts and Crafts to Victorian. And then there are those architects who take an existing structure, like a barn, and convert it into residential living space. The commissioned 5,054-square-foot house at 58 Wells Hill Road in the Lower Weston neighborhood almost defies description. Almost. This “must-see” architecturally significant home was designed by world renowned architect Yann Weymouth, then of Redroof Design of New York. “Weymouth served as chief of design for I.M. Pei on the National Gallery of Art East Wing in Washington and the Grand Louvre Project in Paris” according to the website for the American Institute of Architects. He also designed the Salvador Dali Museum (The Dali) in St. Petersburg, Florida. For this project Weymouth incorporated old and new, protecting one structure inside another. Think sheath, think butterfly within a cocoon, only this cocoon is not just functional. It is also attractive. At first glance it appears to be a converted barn, and, in truth, its outer shell is an actual barn; a vintage onion barn that was disassembled from its original site in Westport, where it was constructed more than 150 years ago, and then reconstructed in its current location. But this house is not a converted barn. The charcoal gray barn structure serves more as an outer layer for the contemporary four-bedroom house that lies within the framework of the reconstructed barn, parts of which were incorporated into the house. During construction in 1981 builders used the original siding, chestnut posts, rough-hewn exposed beams, and wide-plank pine floors. Despite this outer shell there is plenty of natural light coming into the windows and skylights. Some of the skylights are quite large allowing views to see the rafters of the barn and others provide views of the sky. Rooms were deliberately oriented to maximize the use of light making the home bright and sunny even with its covering. According to an article in House & Garden magazine in April 1982 Weymouth considered the position of the sun throughout the day and organized rooms to maximize the light. The master bedroom was given an eastern exposure while the dining room has a western orientation. Multiple decks/balconies - some open, some covered, were placed on the south-facing side, giving its occupants a dramatic skyline from which to take in colorful sunrises and sunsets, and tree-top views. The current owners said this is one of the highest points in Fairfield County and with their expansive view they can see approaching rain storms way in the distance. In the article Weymouth defined this house as a “juxtaposition of soft and hard, warm and cool, textured and smooth, romantic and classical.” It sits high on a hillside of former pasture land on a 2.73-acre level and sloping property near several natural assets including Freeborn Trail and Trout Brook Valley Preserve. The open space area, managed by the Aspetuck Land Trust, features nearly 14 miles of trails - some easy and some more challenging, and there are two trails for horseback riding. The current owners said they also appreciate walking to the Olde Blue Bird Inn restaurant on Black Rock Turnpike in neighboring Easton. Subsequent owners reinforced the barn adding new cedar siding and adding a 50-year shingle roof and steel beams for reinforcement, according to the listing agent. There was also the addition of a detached two-car garage containing an apartment with a fireplace, sleeping loft, and kitchenette. The garage also has a separate studio and a workshop. The main house and garage are connected by the sizable wrap-around deck. Twelve new Anderson windows were installed on the east side of the house. Inside this 13-room house, the first floor’s two-story open living area features a living room with a fireplace, dining room, kitchen, and a first floor en suite bedroom. On the second floor the master bedroom suite has a fireplace and its own balcony, and there is a cozy loft for family games or watching television. The lower level houses a family room, which could be used as an office, two bedrooms, a full bath, an exercise or storage room, and laundry room. For more information or to make an appointment to see the house contact Merry Hampton of William Raveis Real Estate at 203-247-7622 or merry.hampton@raveis.com.